The Google Chrome browser is now the default Android browser and not without good reason. It is a quick, lightweight browser that is intuitive and easy to use. However, as swift as Chrome may be, there are always a few tweaks that you can apply to the browser to make it even more productive for the user. The browser has a host of options neatly tucked away under the Settings panel. Chrome offers a selection of basic and advanced settings, both of which can contribute to a faster browsing experience. The most obvious is the option to clear browsing data – this removes history, cache, cookies, site data etc, freeing up resources to make the browser more secure. Beyond this there is auto-fill, bandwidth management and data clearance for individual sites. The Privacy setting includes the “clear browsing data” option. By default, this includes browser history, cache and cookies. Tap “Clear” to remove default data. Hit Passwords and Auto-fill data for a speed and security boost. The “Save Passwords” option does little to speed up the browser, but does speed up the browsing experience. It is switched on by default and will display saved and never saved passwords. There is the option to delete passwords under “Never Saved” – tap the desired password URL and select “Delete” to remove. Chrome helps speed up the browsing experience by predicting where a user might go next on the page. Data is loaded in the background so links will open quicker. By default this is set to Only on Wi-Fi. Open “Bandwidth Management” and set to “Always” if you have an unlimited data plan. “Usage and Crash Reports” is part of Privacy and is set to “Never Send” by default. This means that no reports will be sent to help improve the performance of the browser. To send reports via the fastest option tap usage and crash reports and select “Only Send on Wi-Fi”. “Content Settings” contain more settings and offers access to advanced settings for individual websites. 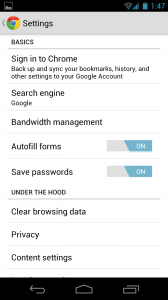 Tap “Website Settings” to view which sites have data or location permissions stored on the device. Each site is assigned an icon to represent data or location access. Tap a site, hit “Clear Stored Data” and select “Clear All” to delete data.